In the latest installment of Disney's ad campaign, High School Musical real life couple Zac Efron and Vanessa Hudgens pose ala Prince Charming and Sleeping Beauty. 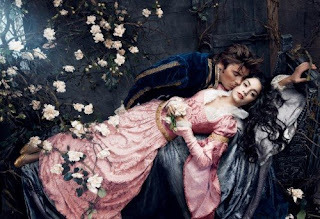 In the shot photographed by Annie Leibovitz, the couple recreated the scene from Sleeping Beauty wherein the princess is awakened by the kiss of prince charming. The Disney ad campaign was titled "Where Romance Is Celebrated." just saw that zac has a movie of his own i think. thank you for following my blog! keep it up and lets make more money online! wow.. this pretty picture I see they look like dolls.